With windowed apps, a taskbar, and proper mouse support, Remix OS goes where stock Android hasn’t. The former Googlers behind Jide Technology have always insisted that they’re a software company. Now they’re making good on those claims with a work-centric version of Android that runs on any desktop PC. 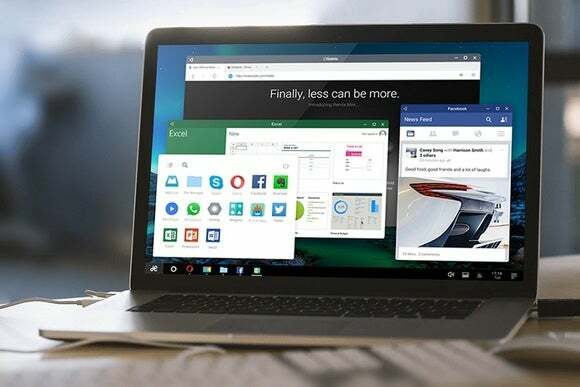 The software, known as Remix OS, is a highly-modified Android ROM with features you’d expect on a laptop or desktop computer. Users can run apps in full screen or smaller windows, and all open programs appear in a taskbar on the bottom of the screen. Remix is also optimized for a mouse or trackpad, so users can right-click in certain apps to see contextual pop-up menus. Remix OS first debuted last year on a tablet with an attachable keyboard dock, resembling Microsoft’s Surface devices, and is also available on a lightweight $70 desktop. But now, Jide is making Remiix OS available to anyone who wants to run it on a bootable USB flash drive. If you meet those requirements and are up for experimenting, you can download Remix OS for PC from Jide’s website. Unzip the file, then use the included USB tool to burn the .ISO file onto your flash drive. You’ll then need to tweak your PC’s boot options (usually by hitting F12 during startup) to boot from the flash drive instead of launching into Windows or Mac OS X. The story behind the story: Google has never cared much about optimizing Android for laptops and desktops, as the company has been focusing on Chrome OS for those purposes. But with rumors of an Android-Chrome OS merger on the way, it’s possible that Android is about to take the desktop more seriously. For now, Jide has a slim window of opportunity to build something better, which may explain why it’s putting out a free public version for anyone to try.